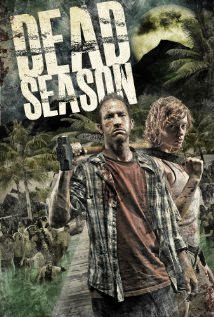 For tonight's movie, we watched Dead Season, which is another zombie movie that I had not heard about. I was surprised to see that it came out in 2012 and after watching it, I was even more surprised to see the bad reviews it got. I actually thought that it was a pretty good zombie movie and I would recommend it to other zombie lovers. The biggest issue I have is that I just don't get the title. I was thinking it was like hunting season, but for dead people. It really didn't fit the story at all though. I thought the story was pretty interesting and there are not a lot of other movies like it. The main characters basically end up on an island that is controlled by some crazy military guy and everyone on the island is forced to become cannibals for food. The only other food source they had was irradiated food, thanks to the island being used as a bomb test range in the past. As for the zombies, these ones turned out to be pretty well thought out. They even had a little twist, which is that anyone who eats other people before death turn into a slightly different zombie. The ones that eat other humans before they die as basically just more aggressive and faster moving. I thought that was an interesting thing to add to the otherwise bland zombies. One thing that I liked about these zombies is that they did bring about the end of the world. To me, that is one of the things that makes a good zombie movie. I really like to see mankind trying to survive when almost everyone is wiped out. It was just too bad that the normal zombies were not a little more aggressive. At some points it made it a little hard to believe that they killed everyone in the world. And now, on to my quick zombie summary. We are still going strong so keep checking back for more zombies during #undeadOctober!